Article Index: What Are Authentic Vogel Crystals? The purpose of this article is to introduce you to a powerful way of connecting with the earth's healing energy. One of these connectors is natural quartz crystal that are cut to unfold their fullest power. They are referred to as AUTHENTIC Vogel Crystals. Marcel Vogel (1917-1991) was with IBM for 27 years doing research and development. He developed the magnetic coating for IBM's disc drive, the first liquid crystal displays, or LCD, and researched the effect of the mind and emotion on plants. He eventually began to use raw, single terminated quartz crystals. By pointing the crystal at another person, he discovered that the crystal amplified thoughts and emotions, often putting the individual into an altered state of consciousness. After leaving IBM, Vogel continued his research on the use of quartz crystals and their ability to heal people. He founded the Psychic Research Inc., a group dedicated to intensive research into healing energies, especially those of various shapes of quartz crystals. He discovered that doubled terminated wands, cut in the same spatial ratios and proportions of the Tree of Life and pyramids of Egypt, are able to transmit energy that can scientifically be measured. Vogel was cutting the wands to reflect the famous alchemical transmutation, “as above, so below.” With the proportions dictated by the Tree of Life and the pyramids of Egypt, he cut the raw quartz -- always pieces that had somehow been broken from their source -- and no longer had a consistent or symmetrical flow of energy. Each raw piece of quartz (clear, smoky, amethyst, citrine, rutilated) was looked at with an inner sense of its true shape. In addition, the quartz crystals were cut to the frequency of water molecules allowing them to resonate with the liquids in the body. The cutting was done with conscious caring and intention that enable the crystal to find its true potential and optimum ability to transmit and amplify energy. Vogel knew that the real origin of illness is in the etheric body. Although the body or emotions sustain a trauma, the etheric body holds the memory of physical or emotional injury and it can become stagnant, distorted, or stuck. The result of this unstable or blocked energy is illness. He discovered that crystals are the common thread in healing that ties together energy, illness, and problems in the etheric body. Whenever light from the higher realms comes into a person's body, the light gets refracted if the etheric body is not stable. This can cause illness. The Vogel cut crystal gives the user immediate access to the etheric body and stabilizes it, allowing light from the higher realms to enter. Also, a matrix or template of perfection already exists inside the etheric body. Even when there is physical or emotional trauma, the matrix still exists and can be brought back to optimum conditions by the use of Vogel cut crystals. The actual technique used by the Vogel practitioner is simple but intense. The first key is the clear intention of sending only healing and love to the one being healed. In addition, when learning to do healing, the practitioner develops the ability to clear his or her mind and intentions, as well as raise their state of consciousness. A practitioner can meditate with the wand over the thymus, sometimes called the seat of the soul located in the middle of the chest above the heart. The crystal will help to train the user's ability to concentrate, stay conscious of thoughts and feelings, align inner energy, focus intention, and prepare to bring the best possible healing to the one being healed. The person doing the treatment with a Vogel cut crystal directs the crystal in an amplified field up and down the persons body until the charge is at maximum. The individual being treated visualizes the area to be treated and goes to the cause of his or her discomfort, imaging that it will be released with a pulse of breath. This breaks up and clears patterns of trauma that have been stored in bone, organs, or tissue. Each of the Vogel crystals are cut and tuned to the vibration of water (see our article, How Do I Know It's A Real Vogel?). The number of sides the crystal has determines the charge capacity. 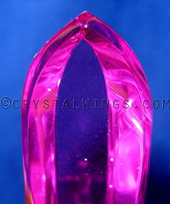 The four-sided healing crystal is for treatment of the body. The six-sided crystal is for emotional problems. The eight-sided is for treating deep shock and severe trauma. The thirteen-sided reaches into past lives and releases blocks and resolves trauma. Since Marcel's death in 1991, several new cuts of crystals have been developed by two of the top lapidary experts in the world. Carrying on the Vogel tradition, the crystals are tuned to specific healing abilities. One of the cutters, trained by Marcel himself, developed special meditation tools to aid crystal healers and those who wish to work on themselves. The two major new cuts he has done are the Vision Quest cut and the Foreseer. Both cuts enhance the individual's ability to go within and develop inner resources, increase psychic ability, and are grounding. The Vision Quest has teaching qualities and The Foreseer aides in seeing past and future issues. This lapidary artist continues to produce the highest quality 4, 6, 8, 13, and multi-sided Vogel cuts. Another lapidary expert, from Brazil, has developed several new cuts. He is responsible for the new concave facets that facilitate the individual in tuning into the crystal, pulling them within in such a way that they are further aligned to inner connections with unlimited healing and love. This cutter developed the twenty-one sided, twenty-four/eight, the twenty-four/twelve, and the Dream Crystal. The twenty-one sided Vogel crystal, in addition to overall healing qualities, also deal with intense family issues, racial conflict or trauma, problems originating from the environment, and difficulties arising from magnetic disruptions, sun spots, meteors, and the ozone. The twenty-one sided also heals past life issues that relate to the above difficulties. The 24/8, a twenty four sided crystal that has eight facets on each of the points is best used for issues of major life transitions, to heal issues related to the misuse of magic, or from traumas sustained while involved in a spiritual practice. It is also used to strengthen the individual's protection while involved in any of the above mentioned situations. The 24/12, a twenty four-sided with twelve facets on each end is used for initiation, to heal the trauma of an initiation, to access and reconnect both conscious and unconscious processes, and as a stabilizer to enable the individual to accept paradox, miracle, or transformation. Crystals with even more facets than twenty four are sometimes used when special needs arise and the practitioner feels that a specific number of facets will aid that work. The Dream Crystal has four major concave sides each connected by three smaller facets. A total of 16 sides on the body and 24 sides on each end create a complex and focused rare gift from Marcel who appeared in a dream to give instructions for this crystal cut. Some practitioners are using them to dream travel, work in other realms, and realize ones deepest dreams. In addition, the Dream Crystal has an ability to enable the practitioner to invoke a more precise and strong blueprint of health in the etheric body for the one being healed. It's full potentials are not yet known. Anyone who wants to connect more deeply with the earth's resources can see that Marcel Vogel was a true visionary. He was a pioneer in the research on the use of the earth's gift of crystal. For this we are thankful. Bill Hurley, certified in 1985 by Marcel Vogel, occasionally gives seminars and does private sessions. He also owns and operates Crystal Wings in Mt. Shasta, providing exceptional healing tools for the metaphysical community. He may be reached at 530-926-3041, or by e-mail, crystalwgs@jps.net.